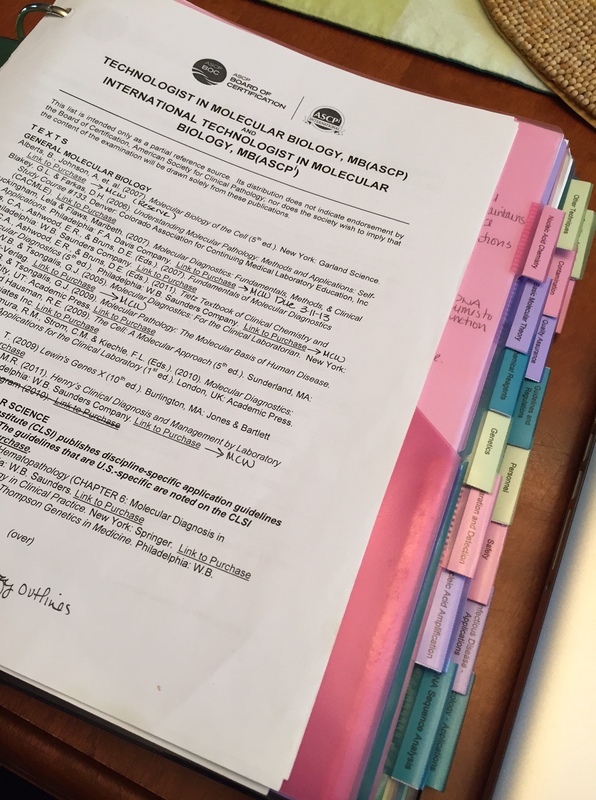 While I have been working in the field of all things “Molecular” for close to twelve years, it wasn’t until early this year that I decided to actually sit for the ASCP certification exam in Molecular Biology. With over five years working in research and currently going on seven years in a clinical lab, I was feeling pretty confident about my knowledge and background, but then panic set in. Would I be able to pass a test? I haven’t taken an exam since my final years of college! I have two young children who are extremely active in extracurricular activities, a husband who also works full time. Needless to say, any extra time I had for myself would be spent studying. It didn’t take long to find out that while there was a very general outline of topics covered and an extensive list of textbooks to serve as a starting point, there were not specific details on where to focus my efforts. There was no single study guide, no tangible tools I could utilize to make exam preparation fit into my busy life any easier. Fast forward to the present, where all of the panic was for not. In February I did pass (with flying colors) and happily sport MB (ASCP)CM after my name. When I was recently approached about writing on a regular basis for Lablogatory, I knew it would be an amazing opportunity to educate others on the exciting field of Molecular Diagnostics as well as combat the fear that comes with taking the Molecular Biology exam. I plan to focus on more specific areas in the field of Molecular Diagnostics that I came across in my studies, which will help others in their preparation for the MB(ASCP) exam. I will cover theory, applications, techniques, and practices. Also, keep an eye out for case study questions that I will provide to stretch your thinking through interpretation of molecular results, at the same time, keeping you up to date on hot topics in the field. With all that said, the first most important suggestion I have is: spend time preparing to study. While it might seem silly to some, having a plan BEFORE you jump into study mode will actually set you up for success. All too often, just reading everything you can on every single topic will result in information overload and ultimately burn you out. You will quickly find yourself jumping all over the place frantically trying to memorize every detail you come across. First, browse the content outline and choose some texts to review. Notice how I say, “Choose some?” Don’t feel like you have to read all of them. I went online and reviewed the texts, I asked colleagues for recommendations, then decided to purchase two books. You might find that you need more or less, just don’t go overboard. Next organize a binder. I am extremely visual and hands on so I study best with things in front of me that aren’t electronic based. I divided my binder based on the content outline. You will come across papers, technical notes, and procedures that you will want to keep as study tools. Having a binder for all of these notes from multiple sources will keep you on track. It will also serve as a great reference guide for you as you move through your career. Now is where you can get super retro. You may have noticed in my photos that I made flash cards! It is a little archaic and time consuming, but I knew I was going to be busy with my daughter’s traveling basketball team; therefore, I needed something small I could take with me to study while sitting on the bleachers. I am aware of software programs that allow you to make electronic based flash cards, so if that works better for you feel free to try that route. My take home message is, obtain and prepare whatever tools you need to get yourself ready to study. Organization is key and setting aside time each day, even if only an hour to focus on one application or theory will definitely be to your benefit. Reach out to colleagues and gather as much information as you can. Once all of your tools are in place, it’s time to get to work! For anyone interested in obtaining their MB(ASCP) certification, I urge you to check out the content outline and list of texts on the ASCP Board of Certification site. Did your certification lead to a raise? Every employer is different. I have colleagues at other institutions that have received promotions and an increase in salary after receiving their certification. For me personally, it did not lead to a raise. However, it was one of my personal professional goals to obtain my ASCP certification in Molecular Biology. In doing so, it has opened up many exciting opportunities for me. I am a huge advocate for professional development so this was just something extra I wanted to do to help set me apart as a leader within my department. With the rise in popularity of molecular based testing, as well as how fast technology changes, I firmly believe that there is going to be an increase in employers requiring staff to obtain their certification in Molecular Biology. I am a HTL and I am very interested in gaining this verification. I have not worked in a molecular in awhile and when I did it was mostly DNA and The extraction and nanojet (RNA) injections. What do you think in the sea of books out there is the most successful at explaining the science and techniques? Any information is greatly appreciated. Hi! 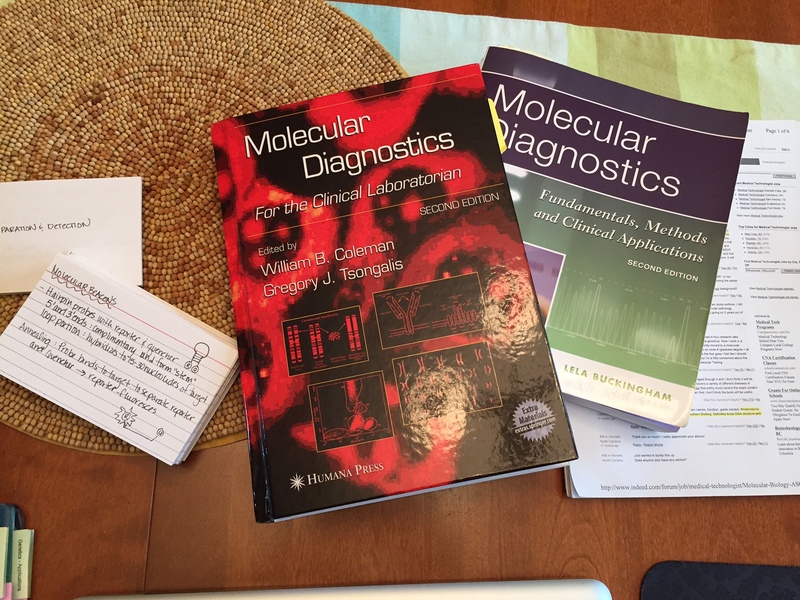 I used the two books shown above: Molecular Diagnostics for the Clinical Laboratorian and Molecular Diagnostics Fundamentals, Methods, and Clinical Applications. Both have a ton of info that will be of huge help when studying! Best of luck to you! ASCPi was established to provide a certification that would allow foreign graduates to be more competitive in their native countries. However, ASCP realizes that many international candidates have an interest in working abroad, particularly in the USA. Please note that in the USA, most Laboratory Directors choose to hire only certified individuals to ensure their employees are competent. Laboratory accreditation requirements may also necessitate laboratory practitioners are certified. It is always recommended to call your prospective employer and find out about the employment requirements with your background. You may also want to visit CGFNS website regarding employment in the USA. Their website is http://www.cgfns.org. Best wishes for a successful career with your ASCP International credential! Can you please outline the type of questions that you encountered in exam? As far as I know, every all the questions consist of the PCR related technology. For example, nested PCR, real time PCR, RT-PCR, PCR optimization conditions, southern blotting, sequencing techniques and disease related genetic marker. My name is Kavitha and I wish to take MB(ASCP). I have B.S in microbiology and also M(ASCP). Do you think MB will be an add on to my career. I worked in molecular biology for 6 months and it was mostly DNA sequencing. After that I wish to take Molecular biology as my career. Please suggest me good books for reference. I need to prepare extensively before the exam as I have little knowledge about molecular biology. Hi! I am a huge believer that any extra certification would add to a career. By becoming certified in molecular biology, you will be set apart as an expert in the field at your level! Also, it would make you more marketable for other employment opportunities. As far as studying, I would suggest starting with the two books I mentioned in my post. If you study these you should do well. Also, keep a look out for my past and future posts on this blog as I tend to cover the basics in molecular theory. Best of luck! Thank you. I would like to know if there is any sample question paper for MB(ASCP). I googled but couldn’t find anything. You are correct, there isn’t a single source with questions that are on the exam. In effort to help those interested in studying, you may have noticed that I added questions at the end of my blog posts. Some texts also have questions on the concepts that will help you out. I have Master of science in biology from Canada. Now I am US citizen. May I take the exam to get certificate in US? Many thanks! I think that’s great you would like to receive your MB(ASCP) certification! For details on the requirements needed prior to taking the exam please check out ASCP’s website (www.ascp.org) or contact them directly. Best of luck to you!! I’m considering taking the molecular test within 8-10 months. I have been in cytology for 10 years and want to transition into another field within my current job. I notice there are certificate programs out there. Do you think that’s necessary or a structured study through textbooks is enough to prepare for successfully passing the exam. I don’t have any experience beyond undergraduate study in molecular biology. Your response will be greatly appreciated. While I don’t think it would be necessary to enroll in a certificate program, it definitely would not hurt you. I’ve heard pros and cons from peers, and I can tell you that one of the advantages to taking a certificate course is that many expose you to the molecular laboratory as you get to practice the technical aspects of molecular diagnostics. Basically, I tell people that it all depends on your learning style. If you find that you do better when being held accountable by enrolling in a structured course, by all means go ahead! However, if you are able to focus, set personal deadlines and goals, and do well with self-study, it probably wouldn’t be in your best interest to take a certificate program. Good luck to you! I’m thinking about studying up and sitting for the MB(ASCP) certification. I was wondering if the 2 textbooks you used for your studying would be enough for a person like me, who didn’t have a lot of molecular biology coursework in college. I would say that I have a pretty good general understanding of molecular principles, and I’m very good at retaining information from textbooks. I’m currently a BS,CT(ASCP) with experience operating the Cervista and Aptima platforms. What do you think? That is exciting that you are interested in sitting for the MB(ASCP) exam! Currently, based on what your telling me with your experience and learning style, I do agree that the two texts I used would be enough. However, if find that you are having a hard time grasping a certain topic… it wouldn’t hurt to do more studying via molecular websites and such. In addition, I hope that you follow my monthly posts on this blog as A LOT of what I cover are topics specifically related to the exam. Please reach out to me if you have any further questions! Hello Leanne, I am currently thinking about applying to take the MB ASCP exam next year through the route 3 work experience qualifications. I hear most people take it after completing a one year laboratory training program for CGMBS licensing. Do you think this training/licensing is necessary to pursue a career in molecular biology? I am hoping that passing the exam would help in my career growth since I am on the fence about going back to school. Thanks so much for your input! Please disregard my earlier comment. I just found out that the requirements in California are different from most states. Thank you for your study tips! Thanks for the wonderful post. I am kind of in the same boat, 2 young kids, husband’s job, I have a PhD in Biochemistry with pretty good lab /research experience, I am inclined towards clinical field, but can’t seem to find out a feasible way. I live in Milwaukee area, and figuring out to contact nearby hospitals/labs to get a head start, According to ASCP, to get a categorical certification, I should be eligible to sit for exam with 6 months of experience in the area, I don’t know where to start. I know Wisconsin diagnostic lab sometimes post in job description, they hire non certified bachelors and after one year of training, you can sit for exam, but I really don’t know whom to contact. Do you know if Children hospital of Wisconsin hire well qualified researchers who later can get certification? I even tried UWM, but I will have to go bachelor degree program, where majority of courses I already have done, even if they waive, taking 18 credit/semester is no brainer for a mom with little kids. I would really appreciate, if you could guide me , since you are familiar with Milwaukee area, where to get a head start? You could also look into the Medical College of Wisconsin (but that would be more research compared to clinical). Children’s would be great place, the Blood Center of Wisconsin also has a clinical laboratory. If you are willing to move, there are tons of places throughout Wisconsin! Feel free to message me via LinkedIn if you have more specific questions! I am from Pakistan, It’s my last semester in BSMT (Clinical Lab. Sciences), after that I ‘m considering taking MB(ASCP) as it’s my field of interest and will be continuing my further studies in the same field. Would I be eligible to apply for MB(ASCP) after completing a 6-month internship program in a molecular diagnostic laboratory? Or would I need to first apply for Medical Laboratory Scientist (ASCP) exam?? A prompt response is awaited, Many thanx! Do you still have the outline provided by ASCP? It looks like they took the link down. Also how many hours a day did you dedicate to studying? I work in a FISH laboratory and I want to sit in on the MB ASCP exam and will start studying this month. Great post! I took (and passed!) the exam a couple of years ago and will be renewing my certification this year. Do you know of any other courses or certifications that would be beneficial for a molecular technologist? I feel like I should working on the next thing but I can’t figure out what the next thing should be! Do you have any insight on the difference between the MB and the SMB certifications? I have my MS in Genetics and have been running MolDx departments in regional clinical labs for 5 yrs, so I meet the requirements to take the exam for either. I’m just not finding much on the differences between the two, aside from the fact that the SMB is a Specialist certification. The MB exam is an entry level / technologist level exam. The SMB exam is specialist level, which means that the education and experience requirements to sit for the exam are higher. As well, some management experience is required to sit for SMB (which is not required for MB), and management is tested on the exam. The SMB exam is more difficult than the MB exam. The choice of what to take is really up to you and what your goals are. Hi, I have a PhD in biology. Can I take the ASCP board certification exam without any experinece in clinical lab? How would I know if I am eligible?